Slightly edited version of post originally published under the title, "Printing Firm Refuses to Make Anti-Islamism T-Shirt, Still Sells Che, Bin Laden Gear." Fan of Osama bin Laden? Come to Spreadshirt.com and pick your favorite color and style. Opposed to radical Islam? Get lost! 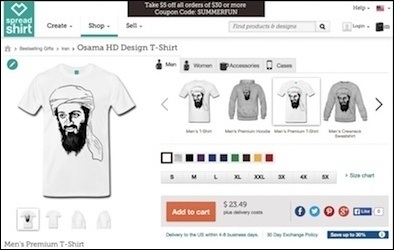 Global printing firm Spreadshirt.com has refused to do business with a supporter of the anti-Islamism PEGIDA group, but still sells T-shirts of Osama bin Laden's face. Spreadshirt, which is based in Germany, has refused to create the design for one of its native customers, Kerstin Bergel, instead replying with a strongly worded e-mail that sought to distance the company from the idea of free speech. What PEGIDA represents is in our eyes not an opinion, but rather a series of racist, discriminatory and inhuman pronouncements. For this reason, we have decided on ethical grounds not to print the name of this ridiculous association. I hope that one day, you realise that you are taking to the streets alongside Nazis. But PEGIDA's followers say it isn't a Nazi or Neo-Nazi group, but rather, stands for Patriotische Europäer gegen die Islamisierung des Abendlandes, or Patriotic Europeans Against the Islamisation of the West. This despite its founder, Lutz Bachmann, having been exposed posing as Adolf Hitler and sharing KKK-influenced material online. Ms. Bergel had her "I love PEDIGA" T-shirt made through another service. 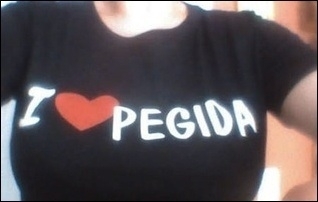 But Ms. Bergel still wanted her "I love PEDIGA" shirt made – and went to another printing company to get it done. Some have been quick to point out Spreadshirt's hypocrisy. Even if they were right in claiming that PEGIDA is a racist group, the company still sells T-shirts with the face of mass murderer and avowed racist Che Guevara, Joseph Stalin with the communist hammer and sickle, and even Osama bin Laden. Spreadshirt also continues to offer anti-PEGIDA apparel, but will not allow supporters of the movement to order pro-PEGIDA products.